Moscow, SANA –Deputy Prime Minister, Foreign and Expatriates Minister Walid al-Moallem affirmed that Turkey’s downing of the Russian warplane is an “act of aggression” that encroaches on the sovereignty of Syria as the plane was shot down in Syrian airspace, adding that Turkey has failed to provide any clear evidence regarding this incident. In a joint press conference with his Russian counterpart Sergey Lavrov, al-Moallem stressed that Turkey is supporting terrorist organizations with weapons and facilitating their movements through the Turkish lands and securing their families. 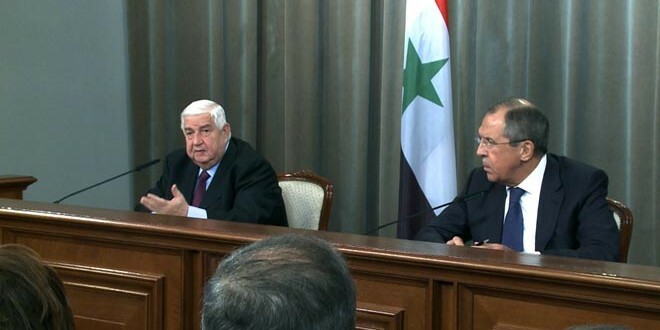 Al-Moallem hailed the stances of the Russian leadership towards Syria, mainly the efforts exerted by minister Lavrov in promoting the political process in Vienna, noting that these stances reflect the depth of the strategic alliance between Syria and Russia, describing his talks with minister Lavrov as “frank and constructive”. Addressing those who are demanding President Bashar al-Assad to step down, al-Moallem said “You are delusional and the reason is obvious because President al-Assad believes in the right of Syrian people to self-determination and will not allow anyone to take this right away,” said Al-Moallem. The minister pointed out that the Russian Air Force in cooperation with Syrian Arab Army had put an end to the dreams of Erdogan which prompted Turkey to mount this aggression. Al-Moallem said that Turkey continues to provide a cover for ISIS oil smuggling operations from Syria and Iraq into Turkey before heading to ports abroad. Al-Moallem challenged the US Secretary of State John Kerry to offer a single piece of evidence that the Syrian side is striking oil deals with ISIS. “After all, it is not his first lie,” al-Moallem mocked. Commenting on the statements of the French Foreign Minister Laurent Fabius, al-Moallem told journalists that Syria has always pointed to Europe’s wrong handling of the crisis in Syria, repeatedly warning that terrorism will backfire on those who support it and regretting that Britain and France are leading the European efforts against Syria’s legitimate government. Fabius’ overtures and willingness to cooperate with the Syrian army, if proven genuine, is welcome, al-Moallem added, but said a drastic change is need in the approach to the Syrian crisis. In turn, Lavrov confirmed that Russia will offer all it can to help Syria in combating terrorism, preserving its national unity, rebuilding it and providing Syria with the effective support on the international level. Lavrov said it is important to prepare a list of terrorist organizations which ought to be kept away from any political process and excluded from any potential ceasefire agreement. If this does not happen, he added, Vienna meeting won’t bear fruit. He pointed out the need to hold Syrian-Syrian dialogue which brings together the Syrian government and part of the opposition adding that all the parties concerned should contribute to supporting a peaceful political process and exert their efforts to launch dialogue. “The essence of the Vienna talks stipulates that the Syrians should determine the future of their country without outside interference, adding that Russia opposes Western attempts to come up with candidates for Syria’s leadership,” Lavrov added. Commenting on the downing of a Russian Su-24 bomber by the Turkish Air Force, Lavrov wondered if Turkey is interested in combating terrorism in Syria and in the efforts to achieve stability and security. Lavrov criticized Turkey’s contradicting statements concerning the downing of the Russian aircraft, particularly claiming that the Turkish air force did not recognize the jet to be Russian, only to contradict this later by stating that Turkey would have responded in the same way had any other jet violated its airspace. Pointing to stepped up procedures against Turkey, Lavrov said Russia has decided to freeze the visa waiver system with Turkey in fear of “real, not hypothetical threats”. Lavrov said eliminating ISIS is a necessity and Syria’s neighboring countries have a special responsibility in this confirming that combating terrorism in the Middle East requires abandoning double standard policies. The minister said Russia strongly supports French President Francois Hollande’s statement about the necessity of closing the Turkish-Syrian borders, indicating that practical steps need to be taken in coordination with the Syrian government to defeat terrorism in Syria. Earlier on Friday, the minister al-Moallem said the Syrian army is making progress on all fronts backed by the Russian air force. During a meeting with his Russian counterpart Sergey Lavrov in Moscow on Friday, al-Moallem thanked the Russian leadership under President Vladimir Putin for its sincere efforts in supporting Syria against terrorism. “We have been at the receiving end of such stabs for over five years,” al-Moallem said. Lavrov, for his part, said his country highly appreciates the Syrian government’s commitment to counterterrorism, vowing continued support for Syria to rout terrorists. “We will continue providing all the necessary assistance to Syria in its war against terrorism in parallel with launching a political process,” added Lavrov, thanking the Syrian army for rescuing the Russian pilot whose aircraft was shot down by Turkey and for providing protection for the Russian embassy in Damascus. “The Turkish leadership has crossed the line of what is acceptable and risks putting Turkey in a most severe situation,” he warned. The Ukrainian president Poroshenko will be welcomed today by François Hollande to ask his support against Russia. The president of the Republic should have refused this meeting. In effect, France does not have to blindly follow the warmonger interests of the United States. The very home of the Rights of Man cannot be rolling out the red carpet for a regime so negationist and criminal. • The plundering of the economy by oligarchs whose level of corruption is unequaled in the region according to observers intermediary between the EU and the IMF. In the light of these points, the President of the French Republic would have done better to ponder the fact that NATO’s military adventurism in Ukraine threatens peace in Europe. But for that, he would need to have a geostrategic vision for France and to have read the Universal Declaration of Human Rights. Vladimir Putin, Angela Merkel, Francois Hollande and Petro Poroshenko took part in the talks on a settlement to the situation in Ukraine. At the final stage, they were joined by Heidi Tagliavini, OSCE Special Representative to the Trilateral Contact Group on the Ukrainian Settlement. Participants from the Russian side included Foreign Minister Sergei Lavrov, Deputy Foreign Minister Georgy Karasin, Presidential Aide Yury Ushakov, and Deputy Chief of Staff of the Presidential Executive Office and Presidential Press Secretary Dmitry Peskov. Following the Normandy format talks, the leaders of Russia, Ukraine, France and Germany adopted a declaration in support of the Measures to Implement the Minsk Agreements adopted on February 12 by the Contact Group on the Ukrainian Settlement. Vladimir Putin also made a statement for the press. This was not the best night of my life, but the morning, I believe, is good. This is because, despite the difficult negotiations, we finally managed to agree on the key issues. Incidentally, you might wonder why the negotiations took so long. In my opinion, this was because unfortunately the Kiev authorities still refuse to have direct contacts with representatives of the Donetsk and Lugansk people’s republics. Even though they have not been recognised, we have to proceed from the realities of life and if everyone wishes to achieve an agreement on establishing long-term relations, direct contacts are essential. We operated under the existing conditions and, in my view, have managed to agree on many things. The first is that we agreed on a ceasefire to begin at midnight on February 15. The second item that I find extremely important is the withdrawal of heavy weapons from the current line of confrontation for Ukrainian troops and from the line established on September 19, 2014 in Minsk for the Donbass self-defence forces. Then comes a set of matters dealing with a long-term political settlement. This includes several items, the first being a constitutional reform that should take into consideration the lawful interests of the people residing on the territory of Donbass. This is followed by matters dealing with a solution to border issues upon agreement with the Donbass militia, humanitarian issues, and the implementation of the earlier adopted law on the special status of the Donetsk and Lugansk territories. Finally, there is a set of economic and humanitarian items. We proceed from the notion that all the parties will show restraint until the complete ceasefire. The problem here was that representatives of the Donetsk and Lugansk people’s republics claimed that in response to the aggressive actions of the Kiev authorities they not only held back the Kiev forces but also managed to mount an offensive and surrounded a group of 6,000 to 8,000 servicemen. They, of course, proceed from the idea that this group will lay down arms and stop its resistance. We nevertheless call on both sides to show restraint and in order to avoid unnecessary excessive bloodshed and casualties they should do everything possible to ensure that the separation of forces, mainly the heavy equipment, is conducted without unnecessary bloodshed. Representatives of the Ukrainian authorities believe their troops have not been surrounded and therefore think this process will go sufficiently smoothly. I had some initial doubts that I can share with you. If the troops really had been surrounded, then, logically, they will try to break free, while those who are on the outside will try to arrange for a corridor for their trapped servicemen. Eventually, we agreed with President Poroshenko that we will instruct our experts – I am ready to do so – to establish what is actually going on there. In addition, I will repeat, we will try to develop a set of measures to verify the implementation of our decisions by both sides. I would like to call on both conflicting parties once again to stop the bloodshed as soon as possible and proceed to a truly political process of a long-term settlement. One document has just been signed by the Minsk Contact Group, it is called Measures to Implement the Minsk Agreements. The other document does not require signing: it is a statement by the President of France, the President of Ukraine, yours truly and the Federal Chancellor of Germany to the effect that we support the process. They have apparently continued for 5 hours and are still not finished though it seems some sort of document is being prepared for tomorrow. 1. If negotiations go on for 5 hours that does not suggest a smooth and conflict free discussion. 2. One of the most interesting things about the Moscow talks is that they mainly happened without the presence of aides and officials i.e. Putin, Hollande and Merkel were by themselves save for interpreters and stenographers. Putin and Merkel are known to be masters of detail and given his background as an enarque I presume Hollande also is. However the German and French officials will be very unhappy about this. The Russians less so because since the meeting is taking place in the Kremlin they are listening in to the discussions via hidden microphones. One wonders why this is happening? Even if the Russian officials are not listening in Merkel and Hollande will assume they are. The fact that Russian officials were not present is therefore less significant than that German and French officials have been barred from the meeting by their respective chiefs, suggesting that Merkel and Hollande do not entirely trust them. There has been an extraordinary degree of secrecy about this whole episode and it rather looks as if Merkel and Hollande were anxious to stop leaks and to prevent information about the talks from getting out. Presumably this is why their officials were barred from the meeting. From whom one wonders do Merkel and Hollande want to keep details of the meeting secret? From the media? From other members of their own governments? From the Americans? What do they need to keep so secret? The frustration and worry on the part of all these groups must be intense. 3. The fact that the British are excluded from the talks is going down very badly with many people here in London. It has not escaped people’s notice that this is the first major negotiation to settle a big crisis in Europe in which Britain is not involved since the one that ended the Franco-Prussian War in 1870. Of course it is largely the fault of the inept diplomacy of Cameron, who has taken such an extreme pro-Ukrainian position that Moscow simply doesn’t see him as someone worth talking to. Also one suspects Merkel and Hollande do not trust Cameron not to leak the whole discussion to whomever they want to keep it from. Having said that it is difficult to see this as anything other than further evidence of Britain’s decline into complete irrelevance. I cannot imagine Thatcher being excluded in this way. If the United Kingdom is indeed in the process of breaking up (and as I suspected the Scottish referendum settled nothing with polls indicating that the SNP may make an almost clean sweep of all the seats in Scotland in the election in May) then the slide into irrelevance still has a long way to go. I am coming increasingly round to the view of Alastair Newman that Merkel and Hollande came with no plan to Moscow but with the purpose of having what diplomats call “a full and frank discussion” in private with Putin looking at all the issues in the one place in Europe – the Kremlin – where they can be confident the Americans are not spying on them. That must be why they sent their officials away. It is also clear that Merkel’s and Hollande’s visit to Kiev before their flight to Moscow was just for show. Poroshenko’s officials are insisting that the question of federalisation was not discussed during Poroshenko’s meeting with Hollande and Merkel. Hollande has however now come out publicly to support “autonomy” for the eastern regions i.e. federalisation, which makes it a virtual certainty that in the meeting in Moscow it was discussed. The point is that Merkel and Hollande did not want to discuss federalisation with Poroshenko because they know the junta adamantly opposes the idea and did not want him to veto it before the meeting in Moscow had even begun. The problem is that since everyone pretends that federalisation is an internal Ukrainian issue to be agreed freely between the two Ukrainian sides, its terms will only be thrashed out once constitutional negotiations between the two Ukrainian sides begin. Since the junta will never willingly agree to federalisation, in reality its form will have to be hammered out in private by Moscow after consultations with the NAF and with Berlin and Paris and then imposed on the junta in the negotiations. Saying this shows how fraught with difficulty this whole process is going to be. Not only are there plenty of people in the Donbass who now oppose federalisation (and some in Moscow too I suspect) but this whole process if it is to work would somehow have to get round the roadblock of the Washington hardliners, who will undoubtedly give their full support to the junta as it tries to obstruct a process over which it has a theoretical veto. Frankly, I wonder whether it can be done. 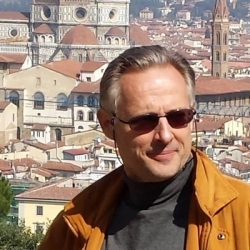 If the process is to have any chance of success then Merkel and Hollande must screw up the courage to do what they failed to do last spring and summer, which is publicly stand up to the hardliners in Washington and Kiev and impose their will upon them. Are they really willing to do that? Given how entrenched attitudes have become over the last few months and given the false position Merkel and Hollande put themselves in by so strongly supporting Kiev, the chances of them pulling this off look much weaker than they did last spring. 1. There is one major difference between the situation now and in the Spring, which might offer some hope of movement. Anyone reading the Western media now cannot fail but see that there is a growing sense of defeat. Sanctions have failed to work, the Ukrainian economy is disintegrating and the junta’s military is being defeated. That was not the case last spring, when many in the West had convinced themselves that the junta would win the military struggle with the NAF. The confrontation strategy Merkel opted for in July based on that belief has totally and visibly failed. It is not therefore surprising if she is now looking for a way-out by reviving some of the ideas that were being floated by the Russians in the spring. She now has a political imperative to look for a solution in order to avoid the appearance of defeat, which would leave her position both in Germany and Europe badly weakened. That political imperative was not there in the spring. It is now. In a sense the pressure is now on her. 2. I should stress that it is Merkel who is Putin’s key interlocutor. The reason Hollande is there and appears to be taking the lead is to provide Merkel with cover. The one thing Merkel cannot afford politically is the appearance of a Moscow-Berlin stitch-up that the hardliners in Washington, Kiev, London, Warsaw and the Baltic States will claim is a new Molotov-Ribbentrop Pact to divide Europe into German and Russian spheres of influence. Whether we like it or not in Germany the shadow of Hitler still hangs heavy and exposes Berlin to endless moral blackmail whenever it tries to pursue with Moscow an independent course. That is why Merkel needs Hollande present when she meets Putin for talks of the sort she’s just had in Moscow. 3. One other possible sign of hope is that there is some evidence that a sea-change in European and especially German opinion may be underway. Whatever the purpose of the ongoing debate in Washington about sending weapons to the junta, whether it is a serious proposal or an attempt to secure diplomatic leverage or a combination of the two, it has horrified opinion in Europe, bringing home to many people there how fundamentally nihilistic US policy has become. All the talk in the Western media yesterday and this morning is of a split between Europe and the US. That is going much too far. However for the first time there is public disagreement in Europe with Washington on the Ukrainian question. Whether that crystallises into an actual break with Washington leading to a serious and sustained European attempt to reach a diplomatic solution to the Ukrainian crisis against Washington’s wishes is an altogether different question. I have to say that for the moment I very much doubt it. 4. I remain deeply pessimistic about this whole process. The best opportunity to settle this conflict diplomatically was last spring. I cannot help but feel that as Peter Lavelle said on the Crosstalk in which I appeared yesterday, the train has now left the station. A peaceful solution to the Ukrainian conflict ultimately depends on European resolve to face down the hardliners in Washington and Kiev. It is going to be much harder to do this now than it was last year. Moreover, despite the bad news on the economy and on the front line in Debaltsevo, the hardliners in Kiev are bound to have been emboldened by all the talk in Washington about sending them arms, which is going to make the effort to bring them round even harder than it already is. The besetting problem of this whole crisis is that the Europeans have never shown either the resolve or the realism to face the hardliners down though it is certainly within their power to do so. In Merkel’s case one has to wonder whether her heart is in it anyway. My view remains that this situation will only be resolved by war, and that the negotiations in Moscow will prove just another footnote to that. 5. 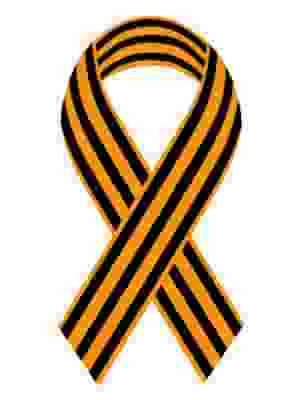 If I am wrong and some autonomy really is granted to the Donbass, then I make one confident prediction. This is that the Ukraine will in that case disintegrate even more rapidly than it would have done if federalisation had been agreed upon last spring or summer. Following such a terrible war, I cannot see people in the Donbass accepting federalisation as anything other than a stepping stone to eventual secession and union with Russia. If the Donbass secures autonomy, I cannot see people in places like Odessa and Kharkov failing to press for an at least equivalent degree of autonomy to that granted to the Donbass. If the Europeans are prepared to see the Donbass achieve autonomy, by what logic can they deny it to the people of Odessa and Kharkov? More to the point, the November elections showed the emergence of what looks like an increasingly strong potential autonomy or even independence movement in Galicia. Given that a terrible war has been fought and lost in the east to defeat “separatism” in the Donbass, and given the widespread disillusion with the junta in Kiev, it is difficult to see how many people in Galicia will not feel betrayed if the grant of federalisation to the Donbass is now imposed on them after so many of their men died to prevent it. If in reaction Galicia presses for the same sort of autonomy as the Donbass – which it could well do – then the Ukraine is finished. I doubt it would hold together for more than a few months. If federalisation had been granted last spring or summer before the war began then it is possible – likely even – that the Ukraine could have been held together in a sort of state of suspended animation at least for a while. I don’t think there’s much chance of that now.